so after picking up the s15 over a month ago, it's finally got its rwc and transferred into my name - with all the troubles i've had registering cars in the past, it's amazing how smooth today went. yeah, the front right drain to the sunroof clearly broken, and the loose drain tube just hanging around there. so, to fix it... a 20c 10mm hose joiner, a spare hose clamp, $5 worth of epoxy - and a spare picture hangar, opened up flat and used as reinforcement under the connection. poured a cup of water through the sunroof drain - and now no leak. i checked the other drains for good measure but they were all connected and draining properly. also grabbed some door seal from clark rubber and added extra door seals on the drivers side, just in case. so, the next thing (now the car is registered) is to prep for track. item#1 - fire extinguisher. make sure the unit meets cams spec (cams regulations) and make up your bracket. i could reuse the extinguisher from last year's wrx but need new mounting brackets. so, with the point of this car being a budget friendly track/club car, and me learning how to wrench on things, i figured a $100 ebay bracket was not the way to go. get yourself some aluminium flat bar from your local hardware shop, a hacksaw and drill, and some M6 high tensile bolts with locking nuts. and because you haven't got good eyes, mount it at a weird angle just behind the passenger seat. one end attaches to the stock rear seat bolt, the other verticle angle attaches to a bolt under the seat - so no new holes in the car. 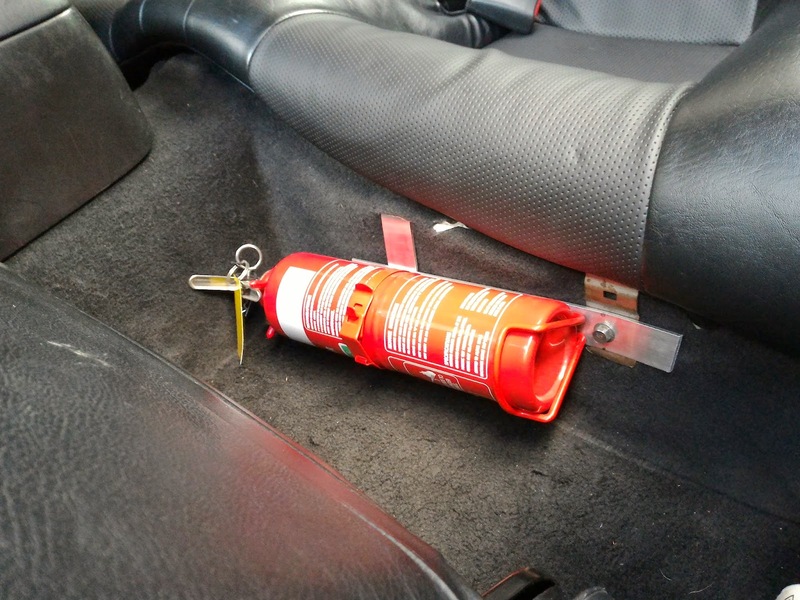 so the regulations state the extinguisher must be accessible from the driver's seat while belted in - would you believe in an s15, it's actually easier to grab the fire extinguisher when mounted here, rather than if it was in front of the front seats on the floor? if you decide to go for full harnesses where you can't lean forward, this is the best spot to mount your gear. though maybe you'll mount it on horizontally. if it shits me enough i'll take that bracket off, redrill another hole an inch higher and have it level. probably too late for this weekend's track day at sandown with ndsoc, but maybe next weekend with aroca/msca? haven't done sandown in about a dozen years, which makes me feel... old. click here to get jdmtune.com vinyl decals for your car - big props to jdmstyledecals.com for sponsorship!